Thank you to everyone who has contacted PRO via social media and email with a question in recent weeks. Q) Do you have a document with regard to using the VAR, stating when to and when not to use it? From outside I feel that it is applied differently from match to match. If you leave it to the referee then it is no use, as they have already made their decision. I feel that the weakest link so far in MLS is refereeing. A) There are extensive instructions from IFAB/FIFA on when and how to use Video Review (VAR – Video Assistant Referee is the official; VR – Video Review is the process). It is based on the philosophy of ‘maximum benefit with minimal interference’ and is only to be used for clear and obvious errors in situations that are direct red card offences, penalties, goals or cases of mistaken identity. It is applied the same way in every match, however, the VAR will only step in when they see a decision on the field that to them is a clear and obvious error or serious missed incident. It is important to note that the referee always makes the final decision. Think of the VAR as a filter that only allows clear and obvious errors to get to the referee to take a second look at. 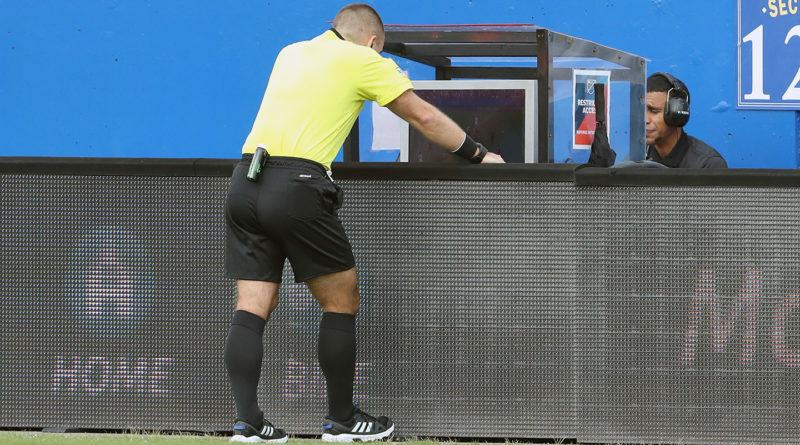 Could you imagine the number of times that the referee would need to go to the monitor (RRA – Referee Review Area) if every incident had to be reviewed? This would certainly interfere with the flow of the match which is against the philosophy of VR. For example, if a red card is shown to a player by the referee, the VAR will check all the broadcast angles available to see if the giving of that red card is a clear and obvious error. If not, the VAR will then inform the referee that the check is complete and play will continue. If the VAR does see a clear and obvious error, they will then recommend to the referee to go to the monitor to take a second look at the incident and provide them with the best camera angles available to make their decision. At this point, the referee will act on what they see on the monitor and make their final decision. The referee can stay with their original decision or change it. In all cases, the referee always makes the final decision. For a detailed explanation of Video Review, you can watch Howard Webb’s piece-by-piece breakdown of the technology here. Q) Why does PRO not report referee stats for NWSL referees? A) PRO is looking to begin reporting referee stats in the near future for both NWSL and USL referees through discussions with companies that provide data services to these leagues. It is something we are definitely interested in and working on providing. Q) Have any referees assigned to be center ref to an NWSL match previously been center referee for an MLS match? If not, why not? A) There have been several referees over the years who have worked NWSL matches as a center referee who now work regularly as MLS referees. There are also current NWSL center referees who have already made their debuts in MLS in 2018, including Joe Dickerson, Ramy Touchan and Victor Rivas, and we look forward to having additional referees assigned to MLS fixtures during the season. Q) Why are NWSL center referees not listed on PRO’s referee roster, and why are none of PRO’s female center referees participating in FIFA international competitions listed there? A) PRO assignments of both NWSL and USL matches can be found on the PRO website under our assignments section. The referees for NWSL and USL matches are U.S. Soccer referees within PRO’s Development Group. We are currently developing that area of the website, but please visit our development features section for some great stories on this talented group of individuals. You can find the International Panel of Women Referees and Assistant Referees listed on the PRO website here. Q) One thing I really need help developing is positioning while I’m the center referee. I’m a USSF referee looking to grade up this semester. How can I improve? A) When it comes to positioning, awareness and anticipation of the next phase of play is in their minds as they decide what position to take. A viewing position that allows you to see between players and the ball will also give the correct angle to judge if there is fair or foul contact. As a developing referee, it is important to realize no two plays are the same and therefore positioning is a very fluid subject. US Soccer and your state instructors have very good advice on this, and PRO referees all relied on this instruction at a similar stage in their careers. Q) If a PK is taken before the whistle is blown and the GK catches the ball, what is the correct way to restart play? A) In this instance, the PK has not actually been taken yet. Referees are advised to restart play for a penalty kick with the whistle (this advice can be found in the Practical Guidelines for Match Officials section in the current Laws of the Game). Therefore, until play is restarted with the whistle here, the penalty kick action from the kicker and goalkeeper is not valid and must be retaken after the whistle is blown.